Ask the Experts – Triathlon Questions, Answered! 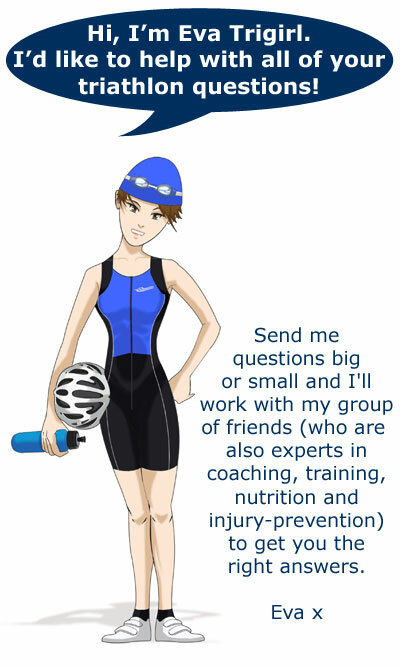 Do you have triathlon questions? We’ve got triathlon answers! Not quite sure how and when to schedule recovery? Are you wondering what to eat for energy and performance? We know that the world of triathlon is sometimes a bit difficult to navigate, so we’re happy to assist with the journey. Trigirl is excited to announce our new ‘Ask the Expert’ section, a place where you can get tips on everything from handling race day nerves to recovering from injury. While you’re at it, take a look around our site for more information about training, motivation, what to wear and, of course, all of the latest Trigirl news! I get those pre-cancerous sun spots and my consultant insists that I cover up well when I race. But I can’t find any long sleeved tri suits – all the tops seem to be not only short sleeved but expose large bits of back as well! Can you direct me to a website where I’d get a top I can both swim, bike and run in? I’m sure i can’t be alone in wanting to cover up given the growing incidence of skin cancer. Thanks for your question. We recognize the need for sun protection, especially if you’ve had issues with pre-cancerous spots before. Remember that harmful UV rays are present on sunny and cloudy days, so be sure to use sunscreen even here in the UK! Trigirl currently doesn’t offer long sleeve options for a few reasons. The drying time is longer for long sleeves and legs, making for an uncomfortable and potentially chilly ride post-swim. A sleeveless trisuit offers more breathability, allowing sweat to evaporate more quickly, again keeping you dry and comfortable. Long sleeves and legs can be restrictive and uncomfortable under a wetsuit and since many races are wetsuit compulsory, a sleeveless suit is a better choice. We recommend racing in a good quality, light weight sleeveless trisuit that dries quickly. For short races using a waterproof sunscreen with a high SPF before the race will help offer protection. For longer races, however, we recommend keeping sunscreen in transition for reapplying. There are also handy travel-size sports sunscreens in a spray formula- perfect for carrying on the bike to keep shoulders protected for longer rides. 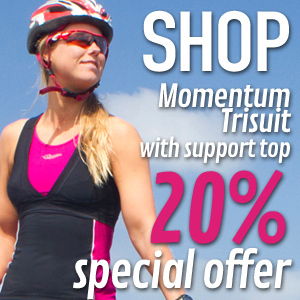 Another option is to keep a fitted cycling jersey or long-sleeved top in transition to slip on after the swim. Obviously this will offer you the most protection while keeping you dry and comfortable. I have been doing triathlons for the last 3 years and loving them. I have been using MTB shoes and spd cleats for cycling and i love the freedom of being able to run in the shoes while getting on & off the bike in transition. The shoes i use are shimano wm61. They are quiet heavy around 850 grams I think. the also have 2 velcro staps and a a ratchet type strap also. Therein lies the problem . the ratchet strap slows me down. I was think of changing to a triathlon specific road shoe Shimano wt52 and putting on a cleat convertor so that i can still use my original pedals etc. Do you think this is ok to do or will i loose power by not using the correct cleat/ I am also worried about the lack of freedom in running when getting off/on the bike. Great to hear about your love for triathlon! If the rachet strap is the problem, why not try an MTB shoe that has velcro straps only? Quite a few of these exist in the market and models such as the Shimano M160 are a bit lighter than what you’re currently using (about 680 gm). Another option is a velcro road shoe that fits multiple cleat styles, such as Shimano Women’s WR31 (515 gm), though because it is a road shoe, you will lose some running ease. A cleat converter is an option, though it will be adding weight back! The cleat will also not be recessed in the shoe, so your transition running freedom will be compromised regardless. There are benefits to using a triathlon-specific shoe which often include a bit of flexibility in the forefoot and a single strap velcro closing system. The strap usually faces towards the drivetrain allowing a moving dismount, though we understand that you may not be comfortable with this. For now, you may be best upgrading to a lighter, all-velcro MTB shoe. If you do decide to have a pedal/shoe overhaul in the future to switch to an SPD-SL system, rest assured that running through transition with the larger cleats is really not too difficult. this is quite possibly a stupid question, but I’m going to ask anyway. I’m doing my first triathlon this year, and I’m really confused about kit. The swim is in open water, so I know I need a wetsuit. Do I wear my trisuit underneath that? And simply peel off the wetsuit when I transition to the bike? Any other advice for a total novice welcome! Thank you! yes, that’s right. You wear your trisuit underneath your wetsuit, nothing else. After exiting the water you peel off your wetsuit and continue the race in your trisuit. Please view both our short YouTube videos Trisuit and Transition for more information. 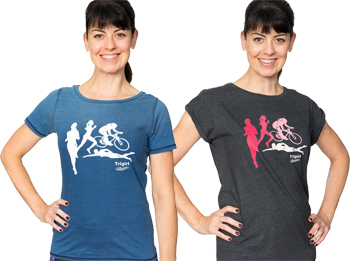 You find the links to our videos in the footer of our website http://www.trigirl.co.uk. There is a wealth of information elsewhere on our website, especially for novices. Just check the tabs Beginner, Training and Kit Advice. You may also want to check out the FAQ section on our website here. Good luck with your first triathlon season. I’m sure you will love it! I’m a novice to triathlon, although I have run and cycled for a few years now. However, over the last year or so I have had to stop all training due to being significantly underweight. I have started a weight-gain plan, but I would really like to know at what BMI it would be safe for me to begin exercise again(albeit very gently at first of course). I have asked my dietician but she has limited knowledge of sports and so has been reluctant to give me any advice on this. Also, could you give me any advice on the best plan to gradually build up my fitness again when it is safe to do so? Firstly, it’s good to hear that you are making a recovery and are looking forward to getting back into triathlon, and that you want to do this with your health’s best interests in mind. Many women (and men for that matter) struggle with weight issues, and I would urge anyone in this situation to always seek good advice from a professional. I think it’s important to understand the motivation behind returning to sport, so that we are sure we are doing it for the right reasons, and not as another strict weight controlling or calorie burning vehicle. Firstly, all of us, regardless of our sport, should aim to have a health body mass index of between 18.5 and 25. Your BMI is a simple sum of weight in kilograms divided by height in meters squared. It’s a useful rule of thumb which relates your height to your weight – and anyone with a BMI of below 18.5 would be considered to be underweight – i.e. being below this BMI means that you are more likely to suffer ill-health in comparison with a person whose weight is within the normal BMI range. Being significantly underweight can impact on your health (e.g. it can switch off menstrual cycles and increase your risk of osteoporosis and bone fracture, it reduces fertility, and it can lead to increase in musculoskeletal soft tissue injuries). It can also adversely affect performance. Returning to sport will increase your calorie and nutritional demands, and it’s really important that these are met, which will almost certainly mean eating better and more than you are currently doing. You will need to think about your iron needs in your diet, and embrace carbs and fats. If it has been long time since you exercised regularly, it is also important to regain good muscular conditioning, to reduce your injury risk. In our athletes, we like to see a healthy body mass index and a normal menstrual cycle – menstrual cycles aren’t dependent on your weight per se, but they are dependent on your calories – too few in each day and too many burned each day will switch off the cycle.. bad news in terms of bones and soft tissues.. Overall, you should aim to have a healthy body, which will stand up to the demands of your sport.. Aim to get your BMI above 18.5 and keep in there, whilst you feed your body well. Thanks to sports medicine physician, Dr. Catherine Spencer-Smith, founder of Sportdoc, for her expert advice! I am new to triathlon and I am planning on doing my first triathlon next season (need to get fit first!!). I am confused about the BTA memberships and I am trying to work out what is best to do. I am not planning on joining my local club and I am training on my own. Should I become a member of BTA Triathlon England? I understand some races require a membership and race license and some just ask for a day fee. Is it better to be a member of this organisation? Currently, if you look on British Triathlon’s website, you’ll see professional triathletes, Alistair and Jonathan Brownlee, proudly displaying their Olympic medals. But British triathlon is not just for the pros! Membership to British Triathlon (actually membership to the triathlon organisation of your Home Nation, i.e., Triathlon England) offers good benefits. Depending on how much you plan to race and your interest level in triathlon, you could find membership very valuable or you could find that the benefits are not that useful to you. We’d recommend trying your first triathlon and paying the day license fee before committing to a yearly membership. Once you know you love all that triathlon has to offer (and we’re pretty sure you will), join to save on race day fees, insurance, magazine subscriptions and more. For a better idea of the benefits offered with membership, see your Home Nations page on British triathlon’s website. I just signed up for my first tri with Human Race Shock Absorber . my motivation is that I said I will do a triathlon on or before my 50th birthday. I can run & cycle but my swimming is non existence be cause I am scare of the water. I have been learning how to semi but it’s stop & start. But this time I have commited . I have 6 months until race day. I want to attend one of your training day. When is the next one pls. Thanks for your email and congratulations on deciding to do a triathlon! Obviously, preparing for the swim needs to be a priority, so let’s try to get you on the right path. First of all, read our article with tips for conquering your swim fears. Then, I recommend starting on a swim course as soon as possible. A training day is great, but will only help to strengthen your technique- there will not be sufficient time on the day to learn swimming. When you’re ready for a training day (which will be a great help to get ready for all aspects of the race), we can recommend our friends at Tri50, who are hosting a few different training days and weekends coming up. See their website here. I’m contemplating doing a sprint triathlon in a couple of months. I can do the distance of each discipline however I’ve never tried them together. However my questions are more about logistics. As a slightly bigger girl who definitely needs lots of support in the chest area I’m not sure any tri suits will fit or would provide me with enough support. It’s a pool swim and I’m not sure the transiston area will be private enough for me to put on some industrial strength sports bra. We recommend and sell the fantastic Anita brand sports bras. They dry extra-quickly, so can be worn from the swim all the way through the run, giving you great support without having to change. They also come in a comprehensive size range! They are perfect under any trisuit without a built-in bra. Best of luck with your triathlon goals! I’m doing my first triathlon in about 4 weeks I’m really looking forward to it and panicking at the same time. My question is, I plan on wearing my sports sunglasses for the cycle, can you wear these for the run too? Congratulations on entering the fun and fabulous world of triathlon. You’re going to love it! My recommendation is always to test EVERYTHING you plan to wear prior to race day. Most sport sunglasses are made to vent properly and stay put (so that they’re not fogged up and bouncing around on your nose!) but I have found that some cycling-specific glasses really bounce around whilst running. That is SUPER annoying. Try them out on a run and decide whether they are comfortable. If not, you may need an alternative (or even a hat or visor if sunglasses really don’t work for you). Happy Training and best of luck in your race! !